Those are the views of Goldrunner (www.GoldrunnerFractalAnalysis.com) as conveyed in his original article which was edited by Lorimer Wilson, editor of www.munKNEE.com (Your Key to Making Money!). Please note that this paragraph must be included in any article re-posting to avoid copyright infringement. The Gold Bull in US Dollars (USD) is a parabolic cycle that is created by the fall in value of the USD. The “US Dollar Index” (USDI) has little relationship to the “Value of the USD” once the other paper currencies in the basket are being devalued aggressively. Thus, the USD is no safe haven except for very short periods of time late in major Gold Bulls. The global competitive currency devaluation (GCCD) process started in earnest in 2010 – much like it did in the late 70’s cycle. Once the GCCDs start in earnest, the USDI becomes little more than a “fake pricing oscillator”, mostly moving sideways and inversely to the Euro, the largest component of paper currency in the US Dollar Basket. The USDI is trading much like it did at the same point in the late 70’s once it became a simple oscillator, and the analogous rise in the late 70’s suggests that it will top in the current period somewhere in the 81 to 84 area – and then it will move back down to its lows as Gold rockets higher. Everybody is waiting with baited breath for the Fed to announce the next round of QE while looking at the false pricing index rise for the USD. The fact is that the Fed just announced the printing of $600 Billion of new USDs that are yet to be factored into the $Gold price. That $600 Billion amount is equal to the total amount of the last course of QE that jettisoned the price of Gold in USDs much higher, and we still expect the Fed to announce a round of QE on top of that so the U.S. Government can pay its bills. 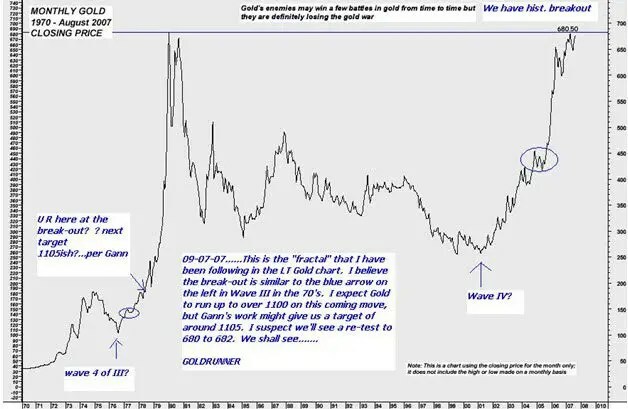 There is no equivalent to “another deflation scare” at this point in the cycle off the late 70’s Gold Chart Model, and we believe it is for obvious reasons. The Gold Bull that is created by the aggressive USD inflation is driven into the form of a parabola by a relatively constant accelerating inflation of the USD. 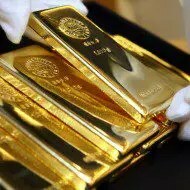 We expect that the market will very soon turn its attention away from the false pricing USDI, and revalue Gold sharply higher against the USD due to the true increased supply metrics at hand. On the chart below you can see the lower channel in green that Gold traded within during the early part of the current Gold Bull running up the low channel base before busting out of the green channel with a huge move out of the top and into a more parabolic growth rate into the blue channel and then underwent parabolic growth as it busted upward into the blue channel. At this stage in the late 70’s, $Gold made a similar sharp run higher and busted out of the top of the blue channel on the $Gold Chart, much like we saw as Gold busted out of the lower channel in 2005. This is how the Golden Parabola grows. We see a relatively constant acceleration in price per period of time – acceleration in price driven by the devaluation of the USD in response to more USDs being printed in an accelerating way or Dollar Inflation. If the USDI reflected the value of the USD at this point in the cycle, the USDI would have fallen to new lows as $Gold was revalued to new highs against the USD as it rose up to $1920, but it did not. The USD basically traded sideways to down from this point forward in the late 70’s while Gold was revalued massively higher against the USD into 1980. Sharp volatility down into the channel bottom can easily be converted into sharp upside momentum if price bottoms and reverses causing investor psychology to reverse sharply. Above and below, are two of the Fractal Gold Charts I posted back in September of 2007 showing where we were in the Fractal Model off of the late 70’s, using two of Dan Norcini’s Gold charts. Note the sharp correction into late 2008 that was denoted on one of the two charts for 2008. 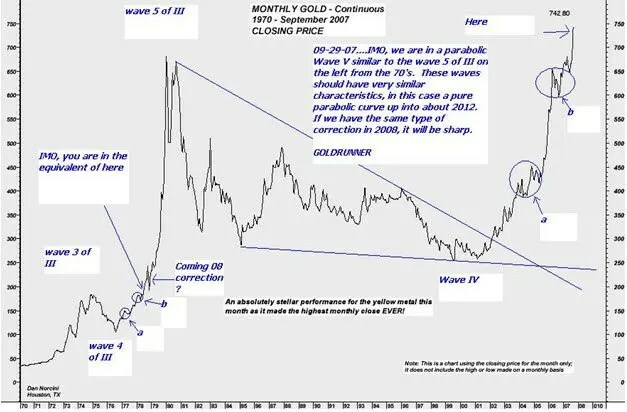 Also note that there is no similar sharp correction further along in the late 70’s Gold chart to match “a second deflation scare for today” as the parabola powered onward and upward. Sign-up for Automatic Receipt of Articles in your Inbox or via FACEBOOK | and/or TWITTERso as not to miss any of the best financial articles on the internet edited for clarity and brevity to ensure you a fast an easy read. 2. 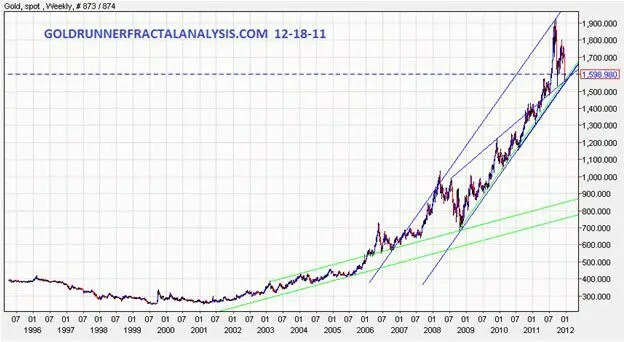 New Analysis Suggests a Parabolic Rise in Price of Gold to $4,380/ozt. 8. Gold Tsunami: on the Cusp of $3,000+? 12. What Do Gold Measurements “Troy” Ounce and “Karat” Really Mean? Previous Alf Field: Will Derivative Losses Be Black Swan Event Propelling Gold to $4,500?